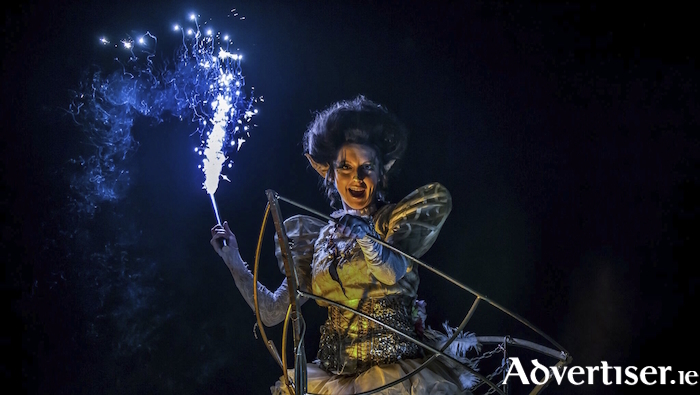 Out Of The Wild Sky, the 2018 Macnas parade, which promises to unleash "a world that is hypnotic and intoxicating, glittering, mysterious, and filled with shadow and nobility," upon Galway streets, takes place at the end of next month. The annual Macnas parade will be held on Sunday October 28, starting at 5.30pm, beginning outside the NUI Galway Aula Maxima, and proceeding along University Road, Salmon Weir Bridge, St Vincent's Avenue, St Francis Street, Eglinton Street, William Street, Shop Street, Church Yard Street, Mainguard Street, Bridge Street, O'Brien's Bridge, Dominick Street Lower, and Dominick Street Upper, before crossing the canal, and moving onto Raven's Terrace and Claddagh Quay. The parade will feature giant creations and sculptural images, pyrotechnics, bespoke costumes, and epic performances to live and original music, all delivered by the Macnas Young Ensemble, Youth Ballet West, the Macnas Youth Drummers, the public participation programme, The Hit Machine, and others. Work on what is Ireland's largest free event has been carried out by 45 professional artists and 300 volunteers directed by CEO/artistic director Noeline Kavanagh, with design by Orla Clogher and Dave Young, costumes by Saileog O’Halloran, sound design by Alma Kelleher, hair by The Face, and make-up design by Michelle Ruane. Eimhin Craddock will lead the Macnas Youth Drummers and Miquel Barcelo will lead the Young Ensemble.